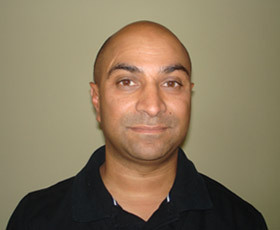 Rakesh qualified from Bristol University in 1992. He did his training in Croydon, and has since been a principal of two dental practices also both in Croydon. He attained his MFGDP postgraduate qualification in 1995. He has been a trainer to newly qualified dentists for many years. His interests lie in the field of cosmetic and restorative dentistry and he has completed a course in advanced cosmetic dentistry in Harley Street, London. Rakesh is a member of the American Academy of Cosmetic Dentistry and the British Academy of Cosmetic Dentistry. Rakesh likes to continually develop his skills and knowledge and regularly attends courses to keep up to date with the latest advances in dentistry. In his free time he enjoys spending time with his family and friends. He also enjoys playing golf, football and cricket.